The Underground Railroad's 20-year run serving soul food in Toronto. Underground Railroad logo from Judith Drynan and James Williamson, Dining In-Toronto: A Collection of Gourmet Recipes for Complete Meals from Toronto’s Finest Restaurants (Peanut Butter Publishing, 1980). Pig’s feet boiled to tender perfection and drenched in mushroom sauce. Annamae Salad, a colourful cabbage slaw with apples, pineapples, and nuts tossed with mayonnaise. Casper Squash mashed with shredded coconut and sweetened with sugar. Mouth-watering barbecued ribs, collard greens, and black-eyed peas. A complimentary basket of corn bread with every meal. Followed by sumptuous, lighter-than-air peach cobbler or sweet potato pie, seasoned with rum, cinnamon, and nutmeg for dessert. 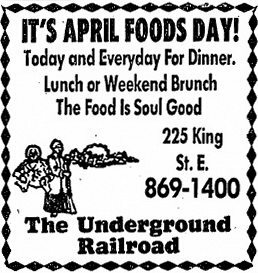 Those were the offerings at The Underground Railroad, Canada’s first soul food restaurant. Opened in early 1969, the establishment became one of the city’s best-known and popular restaurants for over 20 years, where locals took out-of-town guests to rub elbows with celebrities and professional athletes. 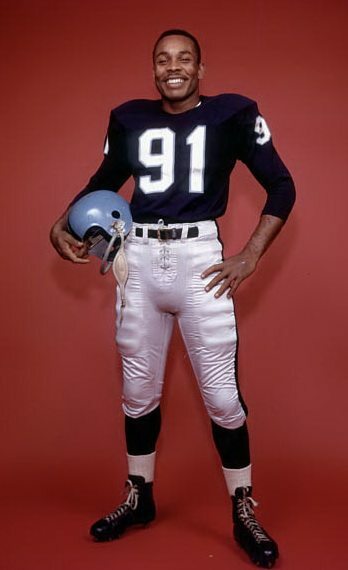 When Georgia native John Henry Jackson came to Toronto in 1960 to become quarterback of the Toronto Argonauts, he pined for the food of home. But soul food, born of necessity in the days of slavery when blacks crafted a homegrown cuisine out of the discards from the master’s kitchen—like pig intestines (or “chitlins”) and the greens of root vegetables—wasn’t served at any restaurants in Toronto. His hankering for home cooking fell to the background while Jackson concentrated on his football career. One of the first black quarterbacks in professional football, the former Indiana Hoosier struggled with the Argos in 1961 and 1962, then played briefly for a Montreal team before returning to Toronto as starting quarterback of the Toronto Rifles of the Continental Football League in 1965, and remaining with the franchise until it folded in 1967. Jackson loved Toronto and wanted stay, so he played in 1968 for the Bramalea Satellites of the Ontario Rugby Football Union, which was used as a taxi squad by the Argos to replace injured players, before finally retiring from professional sport. “He thought that others, too, might enjoy the simple but mouth-watering dishes of black America,” Judith Drynan and James Williamson write in Dining In-Toronto: A Collection of Gourmet Recipes for Complete Meals from Toronto’s Finest Restaurants (Peanut Butter Publishing, 1980), “and so he opened the Underground Railroad.” By the late 1960s, mainstream awareness of soul food was growing with cookbooks being published and joints opening in New York City, Chicago, and Boston, often catering to white clientele. Jackson enlisted friends as business partners: Dave Mann, Argo star who’d been the first player to shake hands when Jackson joined the team; Howard Matthews; and Archie Alleyne. Doing many of the renovations themselves, the co-owners transformed a short-order grill in the basement of 406 Bloor Street East (just west of Sherbourne) into the Underground Railroad. Laying hand-rubbed hemlock flooring, installing rough-hewn wood beams, attaching weathered sideboards to the crudely stuccoed walls, and hanging sugar-sack curtains at the windows over the course of two months, the co-owners sought to recreate the type of wayside hideaway where escaped slaves took refuge on their journey north. Checkered oilcloth tablecloths provided splashes of colour. Lit by antique-style railroad lanterns, the restaurant’s four adjoining rooms seated 60 patrons and created a cozy, rustic, but relaxed atmosphere punctuated with jazz, blues, and soul flowing from the speakers—perhaps drawn from Matthews’ renowned collection of 3,000 albums of black music. The restaurant was like nothing Torontonians had experienced before. 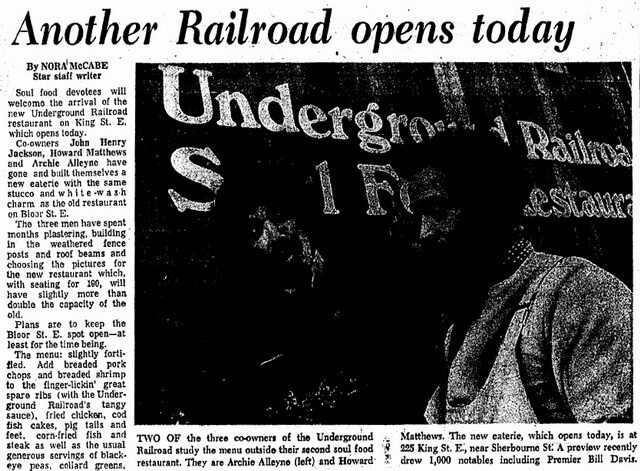 When it opened on February 12, 1969 (Abraham Lincoln’s birthday), the Underground Railroad was an immediate success, arriving at a time when the city’s WASPs (and the mainstream press) were discovering Hungarian, Portuguese, Japanese, and other ethnic cuisines available in town. The restaurant’s opening was emblematic of an increasingly assertive black community in Toronto, and this pride in black culture was evident in how the co-owners’ created the menu. All four contributed handed-down family recipes refined over generations: Mann, whose father was himself a chef, provided recipes for spare ribs and squash; Matthews added the peach cobbler. 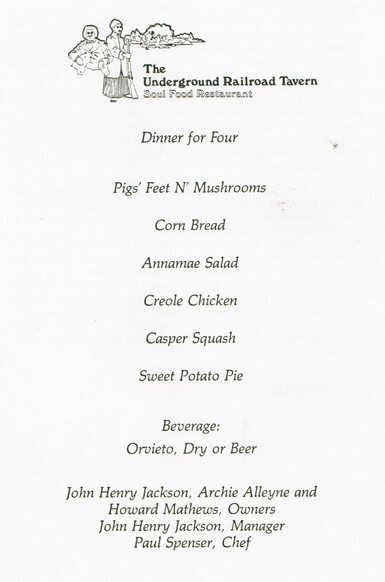 Serving soul food—with Cajun, Creole, and West Indian dishes tossed in—the Underground Railroad’s menu included ham hock, fish gumbo, cornbread, southern fried chicken, hushpuppies, and vegetables like candied yams, collard greens, black-eyed peas, and casper squash. In addition to these traditional soul food offerings, the menu included some upscale items done soul food-style, like ribs with tangy sauce and smothered steak. In the early years of the restaurant, Mann was the Underground Railroad’s most prominent spokesman. He’d starred with the Argonauts for 10 seasons as a running back and receiver—leading the league in receiving yards in 1960 and 1961—and then extended his career by evolving into a prolific punter and kicker who retired with league records for the most career punts and career punting yards. So the former Oregon State University athlete was a highly recognizable figure around town. Mann had learned to cook making supper for his five sisters and two brothers at home in Berkeley, California while his parents worked, so he supervised much of the restaurant’s food prep. Each day during the football season, Mann began his day at the Underground Railroad, supervising the food preparation during the lunch rush. Then, after attending team practice on the CNE grounds in the afternoon, he returned to the restaurant for evening service. 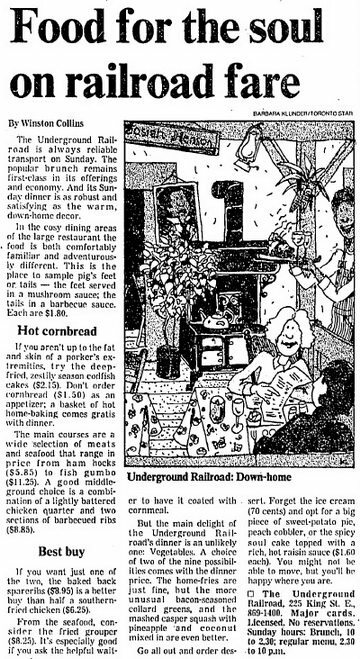 With few staff at the Underground Railroad early on, each of the co-owners took turns cooking, greeting, and serving customers. While Mann and Jackson first met on the football field, Archie Alleyne and Howard Matthews met two decades earlier as classmates at Lansdowne Public School. Alleyne was among the first people Matthews met when his family immigrated from his native St. Kitts in the late 1940s. As a gregarious teenager, Matthews got into trouble and was eventually sent to a boys reformatory, where he learned to cook. After working odd jobs, he and a partner opened the First Floor Club, a jazz club in a former coach house on Asquith Avenue, and later turned the Kibitzeria restaurant, near the University of Toronto, into a blues bar. His wife was Broadway star and jazz and blues singer Salome Bey. Archie Alleyne had been house drummer at the Town Tavern for more than a decade beginning in 1955, playing with touring jazz greats like Billie Holliday, Lester Young, Stan Getz, and Coleman Hawkins. Largely self-taught as a jazz drummer, he toured around the world and regularly featured on CBC TV and radio. Upon entering the restaurant business in 1969, Alleyne initially split time between hosting at the Underground Railroad and playing gigs before putting his musical career on hold in 1970 to focus on the business. 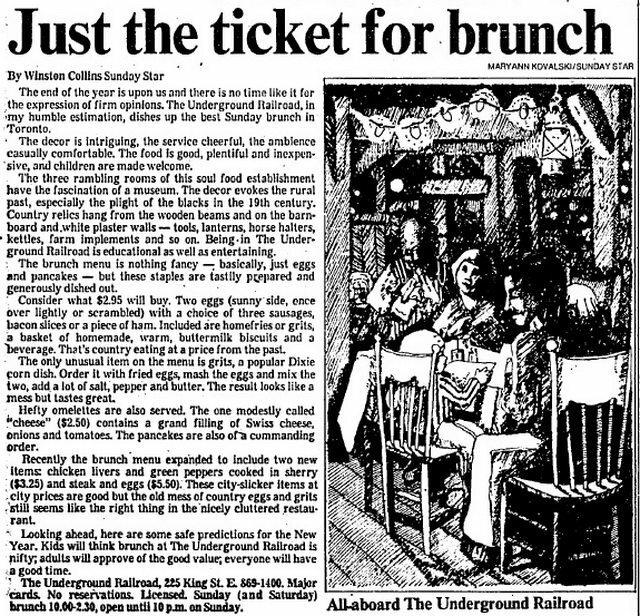 While the food was the primary reason for the Underground Railroad’s success, the friendly atmosphere promoted by the co-owners kept customers coming back. The eatery quickly grew in popularity with locals and celebrities alike. It regularly served busloads of tourists from Rochester, Detroit, and Chicago. And its homestyle cooking made it a haven for longer-term American visitors escaping the Vietnam-era military draft. Every night at the Underground Railroad, there was a good chance common folk would rub elbows with local and international celebrities. Many newspaper writers and television journalists frequented it, like Scott Young or Paul Rimstead, a Toronto Sun reporter and columnist who later hosted a short-lived talk show on Global TV. They dined next to “some of Toronto’s most-established establishment” figures, as one reporter put it, including Premier David Peterson, federal NDP leader Ed Broadbent, and Lincoln Alexander, who would stop in “to get his fix,” when he was Lieutenant Governor of Ontario. Visitors to the Underground Railroad over the years were a who’s who of music, Hollywood, and sports royalty: Harry Belafonte, Dizzy Gillespie, Miles Davis, Mick Jagger, Bob Dylan, Isaac Hayes, B.B. King, Stevie Wonder, Robert Plant, Peter O’Toole, Lee Majors, O.J. Simpson, Magic Johnson, Sugar Ray Leonard—even Bishop Desmond Tutu, who had smothered pork chops and a Tom Collins while in town to give a speech at Massey Hall. Some guests gave impromptu concerts; most famous visitors were commemorated by a framed photo on the wall. Celebrities liked it because they didn’t have to be “on” at the Underground Railroad. “All the black performers who came to town came there, because they found it a little better than McDonald’s, you know?” Alleyne recalled with a laugh years later. Comedian Bill Cosby’s frequent patronage turned to close friendship with John Henry and Anna Jackson (Cosby was godparent to their son) and Dave Mann, who had a bit part in a Cosby feature. Cosby pitched in around the restaurant, as did many regulars who volunteered as impromptu cooks, servers, and bussers when the Underground Railroad got too busy for the staff to handle. He could often be found in the kitchen, preparing his own meals, and hosted tables full of film and TV industry guests, explaining the hows and whats of soul food. For a time, Cosby was interested in partnering with the owners to turn the Underground Railroad into a continent-wide chain. By June 1971, Mann sold his 25 per cent stake in the Underground Railroad to Jackson and severed all ties with the business, though he remained friends with his former partners and particularly with Jackson, who was quoted in numerous obituaries after Mann’s death in May 2012. 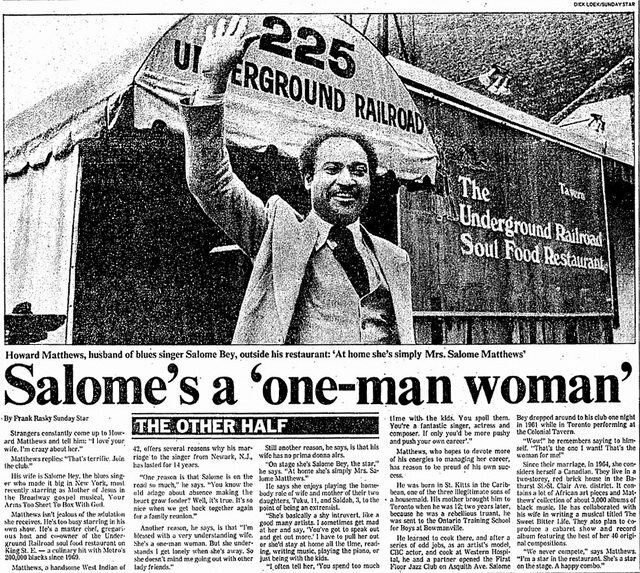 When the Underground Railroad opened a new location at 225 King Street East in April 1973, co-owners Jackson, Alleyne, and Matthews greeted a who’s who of prominent Torontonians. There were politicians like sitting Premier William Davis and Solicitor General John Yaremko, lawyers Roy and Bill McMurtry, writer Austin Clarke, models, musicians, professional athletes, and a coterie of Toronto restauranteurs. The new street-level location on King Street East replicated the decor and atmosphere of the Bloor Street location—which remained in operation for a short while—with white-washed stucco walls covered in Underground Railroad-themed artwork, weathered wooden roof beams, and fence posts. In front, beside a yellow canopy leading to the entrance was a scrubby front garden with an old wagon and a summertime patio. Although it maintained the previous location’s cozy charm with three interlocking rooms at King Street, the seating capacity was doubled. Waiters wore striped railroader overalls, complete with name patch. The Underground Railroad consistently sought to broaden its reach, appealing to families and the theatre crowd. After moving to King Street East, the restaurant introduced Southern Style Sunday Breakfast, serving buttermilk biscuits and grits along with the expected eggs, pancakes, and the like, each weekend from 11 a.m. to 2 p.m. Food critic Winston Collins dubbed it the “best Sunday brunch in Toronto.” Beginning in the mid-1970s, for one Sunday every month brunch was followed by storyteller Joan Bodger, a transplanted Californian, regaling audiences of all ages with folk tales, fables, and legends from around the world. On any given night at the larger King Street East location, the co-owners hung out with restaurant regulars in a nook when they weren’t in the kitchen. Here, they dispensed advice and encouragement, acting alternately as “social workers, therapists, sounding boards, grieving substitute parents, sports and entertainment agents,” as Bruce Blackadar wrote in the Star (August 13, 1988). They let down-on-their-luck passersby board in the restaurant’s basement, and provided turkey dinner with all the trimmings each Christmas Day for those without. As leaders in the black community, the owners of the Underground Railroad sponsored essay contests for black youth and served food during early incarnations of Caribana. After the Blue Jays landed in Toronto in the late 1970s, professional baseball players became frequent guests. The Jays who treated it like a second home included Willie Upshaw, Alfredo Griffin, Damasco Garcia, Jesse Barfield, Lloyd Moseby, and Rance Mulliniks. Cito Gaston, then a batting coach with the team, held his wedding reception there in 1984. 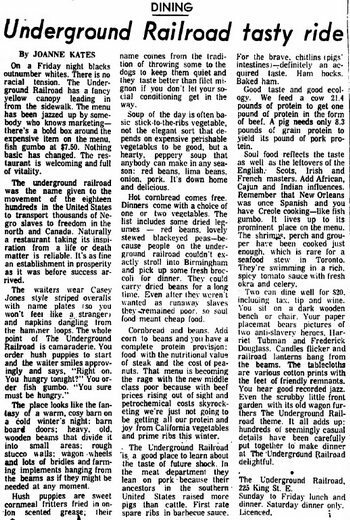 Some of the game’s biggest stars, like Reggie Jackson (who liked to hang out in the kitchen like Cosby), Dave Winfield, Kirk Gibson, Wade Boggs, and Jim Rice, made sure to stop in at the Underground Railroad when in Toronto for a game. Matthews and Alleyne left the business in the early 1980s, and the latter returned to an active performing career in jazz. And, by some accounts, the restaurant suffered a decline in these later years. However, as Jackson had hoped, the restaurant reopened 13 months later. Having secured a new business partner—Randy Gary, who’d been running the Pickle Barrel chain—John Henry Jackson invested $100,000 in renovating a 6,000-square-foot venue at 9 Church Street, just south of Front Street. When it re-opened in September 1989, the restaurant replicated the menu and atmosphere, down to the blues and soul music on the stereo and the artwork and artifacts from the King Street location. “We’re trying a few things different, but you dance with what brought you or sometimes you find yourself going home alone,” John Henry Jackson told the Star‘s Joseph Hall. 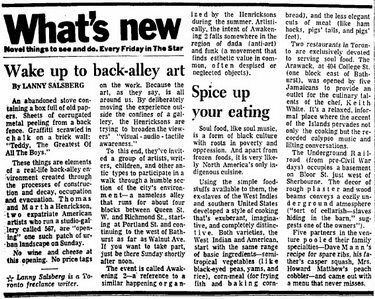 The Star‘s Cynthia Wine complained that the now-expanded menu was too large. “It’s a big menu that takes two hands to hold, but everyone who knows the place accepts that there are only a few things to order.” She suggested the owners concentrate only on the house specialties, like spareribs, fried chicken, black-eyed peas, and collard greens, while panning some of the new additions to the menu. Although loyal regulars reportedly returned at first, that summer the Underground Railroad never saw the tourist trade it had enjoyed in years before. In August 1990—after only 11 months on Church Street—John Henry Jackson and his wife Anna decided to shut it down for good, blaming high interest rates and the looming recession for poor business. “Things went sour in a hurry,” Jackson told Lisa Priest of the Star (August 26, 1990) of their efforts to bring in customers. Sources consulted: Judith Drynan and James Williamson, Dining In-Toronto: A Collection of Gourmet Recipes for Complete Meals from Toronto’s Finest Restaurants (Peanut Butter Publishing, 1980); Dawn P. Williams, Who’s Who in Black Canada 2 (d.p. williams & associates, 2006); Dan Yashinsky, Suddenly They Heard Footsteps: Storytelling for the Twenty-First Century (Random House, 2010); and articles and advertisements from Black Enterprise (June 1979); the Globe and Mail (April 26, June 7, and July 26, 1969; April 4, 1970; February 12, and May 8, 1972; March 9, June 15, and December 19, 1974; September 15, November 29, and December 4, 1975; April 30, November 3, and December 3 & 7, 1977; March 4, July 19, October 30, and November 9, 1978; February 12, and September 18, 1979; February 11, and June 28, 1980; December 5, 1981; June 19, 1982; and February 5, 1983); Toronto Life (April 1969); the Toronto Star (January 24, February 13 & 22, August 23, and November 21, 1969; May 29, and November 7 & 27, 1970; June 18, 1971; January 18, August 24, and October 16, 1972; April 9 & 14, 1973; November 2, 1974; January 6, and December 5, 1975; December 18, 1977; May 28, 1978; February 4, and November 11, 1979; January 27, June 30, and December 26, 1987; August 13, 1988; August 27, September 18, and December 7, 1989; January 10, August 26, September 12, and October 16 & 21, 1990; June 22, 1991; May 2 & 9, 1992; and October 14, 2000).